Economy starts as the gas pedal! And with a Rochester Carburetor behind it, you need just a soft touch to make your GM car go the way it was built to go! That’s because Rochester Carburetors are individually designed and developed to fit exactly the requirements of each car’s engine. 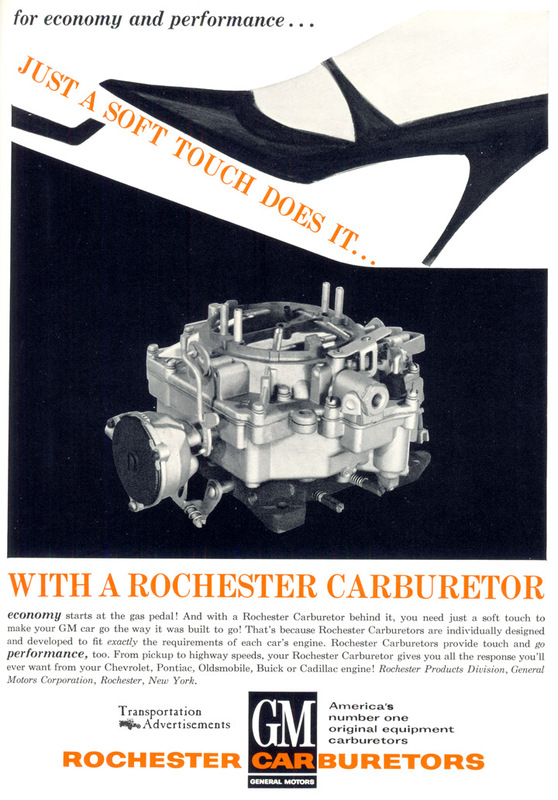 Rochester Carburetors provide touch and go performance, too. From pickup to highway speeds, your Rochester Carburetor gives you all the response you’ll ever want from your Chevrolet, Pontiac, Oldsmobile, Buick or Cadillac engine! Rochester Products Division, General Motors Corporation, Rochester, New York. Transportation Advertisements is powered by	WordPress 5.0.4 and delivered to you in 0.736 seconds using 28 queries.